Home Procurement News Startup makes first official urban drone delivery in U.S.
Startup makes first official urban drone delivery in U.S. There has been a lot of discussion recently about the possibility of drones making deliveries to customers in the future. And it seems that such a reality may not be too far out of reach. Flirtey, a flying robot startup, recently announced that it has officially made the first residential delivery using an unmanned drone in the U.S. that has been approved by the Federal Aviation Administration, the Associated Press reported. On March 10, in Hawthorne, Nevada, the six-rotor autonomous aerial vehicle traveled approximately half a mile, guided through the pre-programmed route by a GPS. The package, which contained a first-aid kit, food and water, was delivered to an unoccupied home. "Conducting the first drone delivery in an urban setting is a major achievement, taking us closer to the day that drones make regular deliveries to your front doorstep," Flirtey CEO Matt Sweeney stated. This is not the only time the flying robot manufacturer made history. The AP also revealed that, in July, Flirtey claimed the first FAA-approved delivery made in a rural setting, which was at a Virginia-based medical facility. The most recent milestone, which the AP said was recorded to include in an documentary for ABC-TV, signals that other companies may soon be able to accelerate their plans for drone deliveries in the U.S. Although retail giants, such as Amazon and Wal-Mart, have already begun developing unmanned aerial vehicle transportation, the operations have mostly been conducted in other countries. According to the AP, the FAA has allowed UAVs to be tested in six states, Nevada being one of them, and the agency is currently working with NASA on creating regulations, guidelines and systems that will minimize the safety hazards of the drones. And the fact that Flirtey was able to use the flying robot to deliver a package without incident indicates progress. 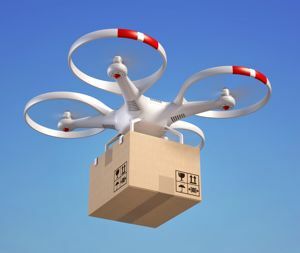 "We think the safest way to deliver packages is for the drone to remain at a distance and lower it into the customer's hand," Sweeney told Fortune. The box was placed on the front porch of the residence, using a rope to lower it down, the source said. In addition, thee drone was being observed and monitored by a pilot on standby in case anything went wrong. Fortunately for Flirtey, and other companies and consumers anticipating the rise of flying robots making deliveries, nothing went wrong.